David Lynch describes his films as “film-paintings—moving portraits captured on celluloid” and his visual style has been referred to as “framed pictures”. Framed photographs have an important significance in his work, particularly in two of my favourites: Twin Peaks (1990), the television series he co-created with Mark Frost and his earlier film, The Elephant Man (1980). 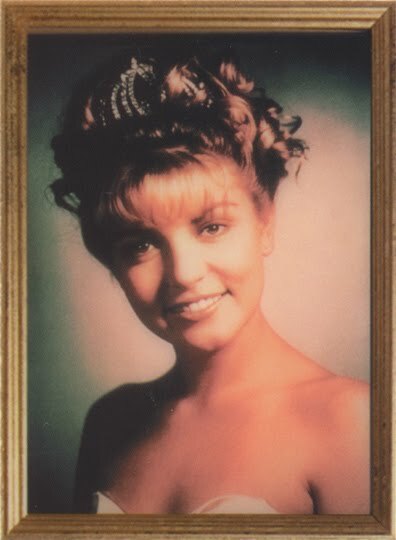 The final shot in most episodes of Twin Peaks is of the iconic framed photograph of Laura Palmer, the high-school prom queen found brutally murdered in the pilot episode. Marc O’Day, whose incisive critique of the work of David Lynch accords best with my own views, describes Lynch as America’s foremost romantic filmmaker whose work “elaborate[s] a distinctive vision of the mythical, wholesome American innocent’s encounter with darkness, decay and evil”. The brutal murder of Laura Palmer exposes the dark underside of the seemingly quiet, average town of Twin Peaks. The symbolic use of the framed photograph of Laura wearing a crown and a gown lends weight to O’Day’s further view positing a dissident conservatism in Lynch’s romantic vision, centring on the family idyll and its desecration. 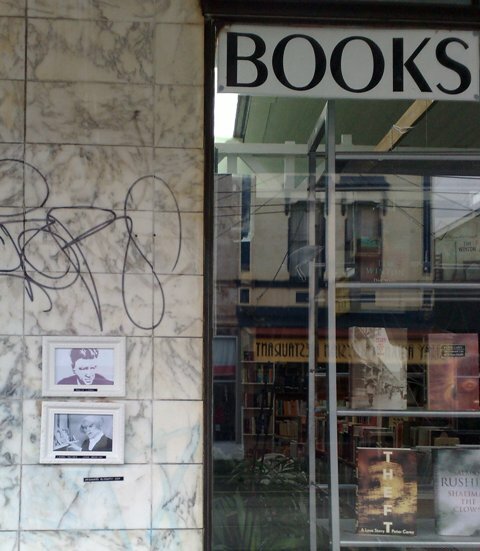 This brings to mind the work of Melbourne-based visual artist, Emidio Puglielli, who draws attention to the symbolic significance of the photograph. His focus on the material properties of the photograph (paper type, size, quality, condition) reveals the power the image has to transcend its materiality, granting it a symbolic-sacred-mythic-iconic status. By exposing the materiality of the photograph as object, Puglielli foregrounds our romance with the image. ‘Cartes-de-visite are often about their reception, as if to underline the psychological or emotional experience that their viewing entails. Many pictures show people holding open photograph albums or simply feature people looking at another carte. It is a reminder that cartes were scaled to be viewed in the hand rather than on a wall; they were meant to be touched as well as seen . . . She poses for the camera to make visible an otherwise abstract experience, the pang of longing, the act of remembrance, the stretching of the imagination. It is as though she wants to draw our attention, not just to the particular image she holds, but to the comforting solidarity of photography’s contiguous memorial function. In touching her photograph she recalls that it too was touched, by that umbilical cord of light that once caressed her loved one and then this image in her hand. In touching it now, she returns the photographic experience to the realm of the body and to the intimacy of reverie’. 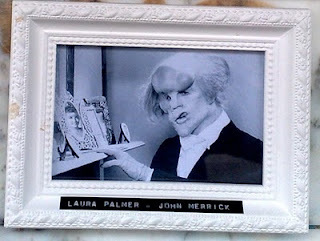 The consoling notion of the “the comforting solidarity of photography’s contiguous memorial function” connects for me with Lynch’s use of the framed photograph in The Elephant Man. The film, an unashamedly sentimental, emotionally affecting melodrama, based on the life of severely deformed Joseph Merrick (John Merrick in the film), opens with the symbolic image of a framed photograph of Merrick’s mother. Throughout the film, Merrick gazes at her treasured portrait which also provides the film with its final, emotionally charged ending—a consoling vision of his mother assuring him that “nothing really dies” hinting at the promise of a reunion in death. Sometimes, even the framed photographs belonging to others elicit empathic, reverent responses in recognition of their sacredness. This is the case with John Merrick whose admiring gaze over the photographs on Doctor Treves’s mantelpiece underscores the deep symbolic investment he has in the photographed image. Unlike John Merrick, I must admit to a distaste for mantlepieces laden with multitudes of framed photographs. Perhaps it’s due to the trauma of being exposed to disingenuous memorials such as the ‘couple’ shots of former acquaintances whose portraits showed them draped on boulders (!) gazing in a stereotypically loving (and cringe-inducing) manner at one another. Or the scary studio glamour portrait photographs belonging to bad taste relatives. However, I do like frames and particularly those I've used for my first frame up. Their dual function of protective casing and embellishment aids further in asserting the symbolic significance and sacredness of the image. 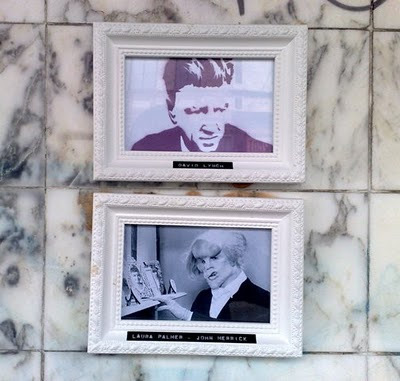 And I am rather partial to my sacred stencil and paste up portraits. Laura Palmer lives! If only briefly. But it was worth the wait.